Standing some three miles west of North Walsham, the church is a landmark for miles around with its massive western tower dominating the skyline. For many years past a parishioner has made it his duty to hoist the flag at the top each morning and lower it each dusk – a charming custom. The church itself consists of a nave and chancel under one roof and, recently a parish room has been added on to the north side of the building. Some years ago a magnificent bequest was left to the church and the year 2000 saw much of the proposed work to the church completed. The interior has been cleaned, and the whole building is now light and airy. 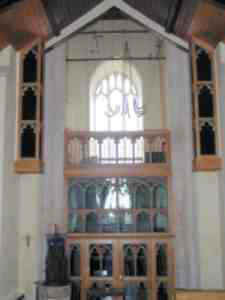 At the west end, under the Tower, a new Ringers' Gallery has been erected and beneath a large room has been provided with fine glass doors leading from the west door to the nave. Within, the west end presents a fine sight as the woodwork provides a suitable front to the gallery and, on either side of the tower arch and matching the new woodwork beneath stand the tone cabinets of the electronic instrument, built by the local firm, Norwich Organs. This new instrument replaces a small one manual five stop organ originally in Intwood Hall and then in Intwood church before being moved here many years ago. Built by the Norwich organ builder, Mark Noble in 1865, this has been removed to the parish church at Tuttington, a couple or so miles away where, standing in the north-east corner of the nave, it looks and sounds very well. Although many would have preferred a new pipe organ, funds would not run to the provision of one and it must be admitted that Norwich Organs have made a most acceptable substitute for "the real thing". The light oak console has been placed on the north side of the church, almost opposite the south door, and several feet in front of the speaker assemblies high above and to the rear. Even full organ comes off remarkably well and there is no 'blasting' from the units. It is a handsome piece of work with ivory (?) drawstops arranged on angle jambs – Great on the right and Swell and Pedal on the left. From the fine Swell strings the build-up is remarkable and the fact that all is 'enclosed' enables one to merge Great and Swell almost imperceptibly. The Swell builds up to a wonderfully effective 'English full Swell' with the Mixture work and excellent reeds being all that is required. On the Great we find a sweet Dulciana, liquid flutes, excellent Diapasons topped with a most realistic Krummhorn and a Posaune topping the whole organ. The Pedal department is most effective, too, with its definitive Principal and Octave, the purring Bourdon with its octave Bass Flute, a most useful four rank Mixture and the climatic reeds – Trombone 16 and Trumpet 8. It would be hard to find anything to dislike on this organ unless one is so prejudiced against electronic instruments that the mere name puts them off! It is a fine creation from local craftsmen – it looks good and it sounds extremely good. Would that I could have one for myself! 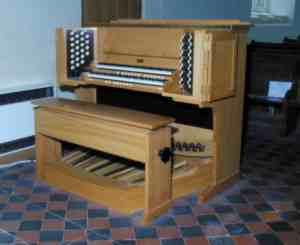 The specification of the Felmingham organ has been based on Norwich Organs standard W902 model with additions.